The silver chalice that is placed in Benjamin's sack when he leaves Egypt is described as being used by Joseph for divination.This is mentioned to reinforce his disguise as an Egyptian nobleman. It was a practice known to be used by Egyptian at thetime, but forbidden by Hebrew Law. The Shahnameh, a 10th-century epic work narrating historical and mythological past of Persia, gives a description of whatwas called the Cup of Jamshid (Jaam-e Jam), which was used by the ancient (mythological) Persian kings for observing all ofthe seven layers of the universe. The cup was said to contain an elixir of immortality, but without cogent explanation for anyrelevance of the elixir to the scrying function. In the late 1820s, Joseph Smith founded the Latter Day Saint movement based in part on what was said to be informationobtained miraculously from the reflections of seer stones. Smith had at least three separate stones, including his favorite, abrown stone he found during excavation of a neighbor's well. He initially used these stones in various treasure-digging questsin the early 1820s, placing the stone in the bottom of his hat and putting his face in the hat to read what he believed were themiraculous reflections from the stone. Smith also said that he had access to a separate set of spectacles composed of seerstones, which he called the Urim and Thummim. He said that, through these stones, he could translate the golden platesthat are the stated source of the Book of Mormon. 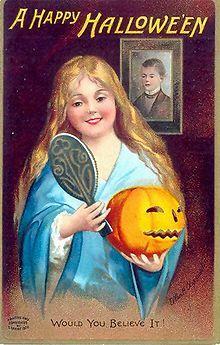 Divination rituals such as the one depictedon this early 20th-century Halloweengreeting card, where a woman stares into amirror in a darkened room to catch a glimpseof the face of her future husband while awitch lurks in the shadows, may be oneorigin of the Bloody Mary legend. This Halloween greeting card from 1904satirizes divination: the young womanhoping to see her future husband sees thereflection of a nearby portrait instead. Rituals that involve many acts similar to scrying in ceremonial magic areretained in the form of folklore and superstition. A formerly widespread traditionheld that young women gazing into a mirror in a darkened room (often onHalloween) could catch a glimpse of their future husband's face in the mirror— or a skull personifying Death if their fate was to die before they married. 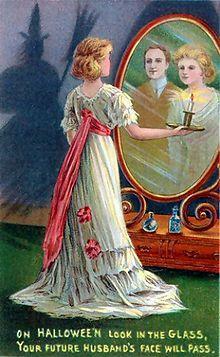 Another form of the tale, involving the same actions of gazing into a mirror in adarkened room, is used as a supernatural dare in the tale of "Bloody Mary".Here, the motive is usually to test the adolescent gazers' mettle against amalevolent witch or ghost, in a ritual designed to allow the scryers' easyescape if the visions summoned prove too frightening. While, as with any sort of folklore, the details may vary, this particular tale(Bloody Mary) encouraged young women to walk up a flight of stairsbackwards, holding a candle and a hand mirror, in a darkened house. As theygazed into the mirror, they were supposed to be able to catch a view of theirfuture husband's face. There was, however, a chance that they would see theskull-face of the Grim Reaper instead; this meant that they were destined todie before they married. Folklore superstitions such as those just mentioned, are not to be distinguishedclearly from traditional tales, within which the reality of such media are takenfor granted. In the fairytale of Snow White for example, the jealous queenconsults a magic mirror, which she asks "Magic mirror on the wall / Who is thefairest of them all? ", to which the mirror always replies "You, my queen, arefairest of all." But when Snow White reaches the age of seven, she becomesas beautiful as the day, and when the queen asks her mirror, it responds:"Queen, you are full fair, 'tis true, but Snow White is fairer than you." Thereis no uniformity among believers, in how seriously they prefer to take suchtales and superstitions. Scrying is not supported by science as a method of predicting the future orobtaining information unavailable to empirical investigation. Some criticsconsider it to be a pseudoscience. Skeptics consider scrying to be theresult of delusion or wishful thinking. Psychologist Leonard Zusne suggested that scrying images arehallucinations or hypnagogic experiences. A 2010 paper in the journal Perception identified one specific method ofreliably reproducing a scrying illusion in a mirror and hypothesized that it"might be caused by low level fluctuations in the stability of edges, shading andoutlines affecting the perceived definition of the face, which gets over-interpreted as ‘someone else’ by the face recognition system." The Dr. John Dee Theater of the Mind research institute, founded by theparapsychologist Raymond Moody, uses crystallomancy as a medium inwhich he claims to enable clients to see apparitions of the dead. The British astrologer and psychic known as Mystic Meg, who came tonational attention as part of the UK's National Lottery draw in 1994, was often portrayed with a crystal ball. Traditional healers from the Yucatán Peninsula and Guatemala use stone crystal balls for scrying. These are known assastun or zaztun. Originally, they were Mayan antiquities that they used to collect in archaeological ruins. Nowadaysthey are mostly modern objects. It is unknown what was the original use of the jade balls found in ancient Mayan burials. Contemporary mass media, such as films, often depict scrying using a crystal ball, stereotypically used by an old gypsywoman. In J. R. R. Tolkien's fictional universe of Middle-earth (especially in The Lord of the Rings), the Palantír is a stone thatallows a viewer to see what any other Palantír sees, and the Mirror of Galadriel is used as a scrying device to see visionsof the past, present, or future. In Christopher Paolini's Inheritance Cycle the use of a mirror to view people and places the viewer knew in the presentwas possible with the drawback of not being able to see anything to which they had no knowledge. The attempt to scry thefuture would cost the user their life. In the videogame Clive Barker's Undying, Patrick Galloway (the player) is shown in possession of a green crystal, TheGel'ziabar Stone, which allows him to scry visions and sounds from the past, that are vital to the various missions. In the US television series Charmed, the sisters scry with a crystal and a map to locate people. Web surfing with keywords such as scrying will retrieve unmanageably large numbers of hits, but they are so various thatthere is no authoritative standard according to which any schools are to be taken more seriously than any others.